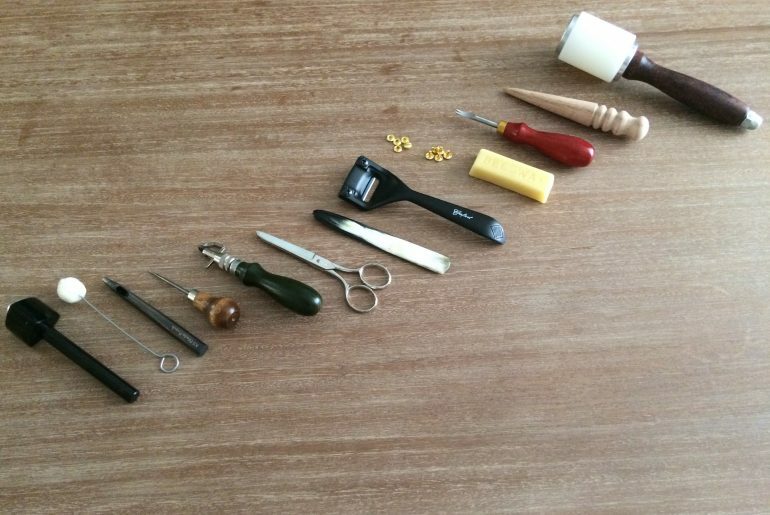 Awesome, so I spent a lot of time learning about leather craft (a tiny, tiny amount in the grand scheme), though enough to feel confident enough to start a leather craft project. As I thought about what I wanted to make, I kept in mind it should be pretty simple so I don’t get frustrated, and easy enough I can try a few skills and see how I fare. 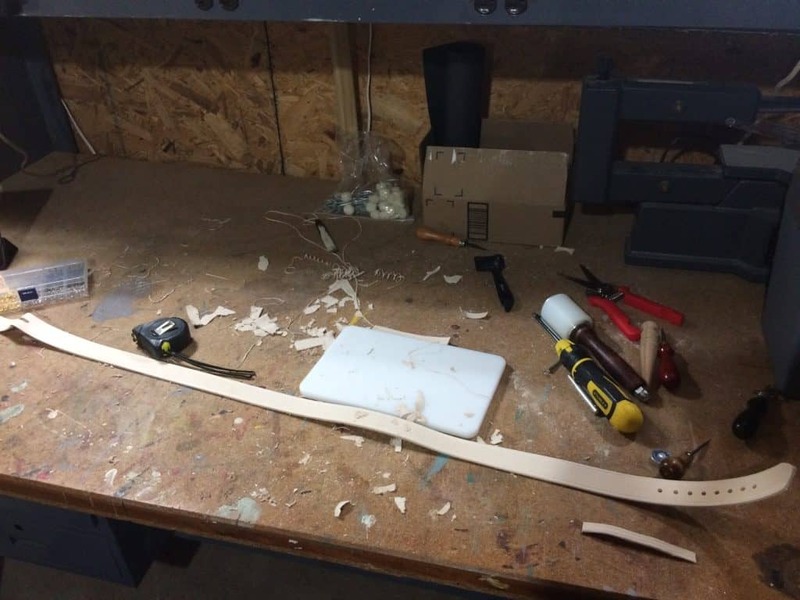 also, I didn’t want it to be too expensive for materials and tools, and ended up with a leather belt project. This would be a good little adventure, so off I went. I ordered the tools (many noted in this post), and got everything together. I wasn’t planning on writing about it or I would have taken more photos, though I have a few and will include them as I go. 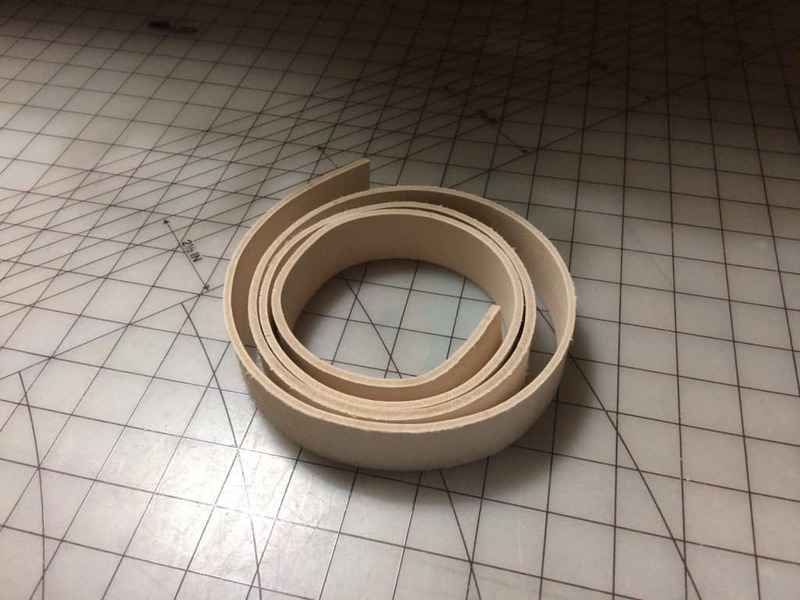 To start, I unrolled the leather belt blank. It smelled nice (mmmm, leather), and felt good in the hand. A comfortable material to work with. It was a little stiff but not too stiff, more a nice, pliable thickness that can be worked/shaped. So this is all new! What to do first? 🙂 I thought edging would be fun, so grabbed the edger and started on an edge near the end of the below (in case I really messed up and needed to trim it off). It went smoothly, slowly and evenly taking off a bit of the corner. Wow, cool! I did a little more and got a feel for it, not as hard as I originally thought. 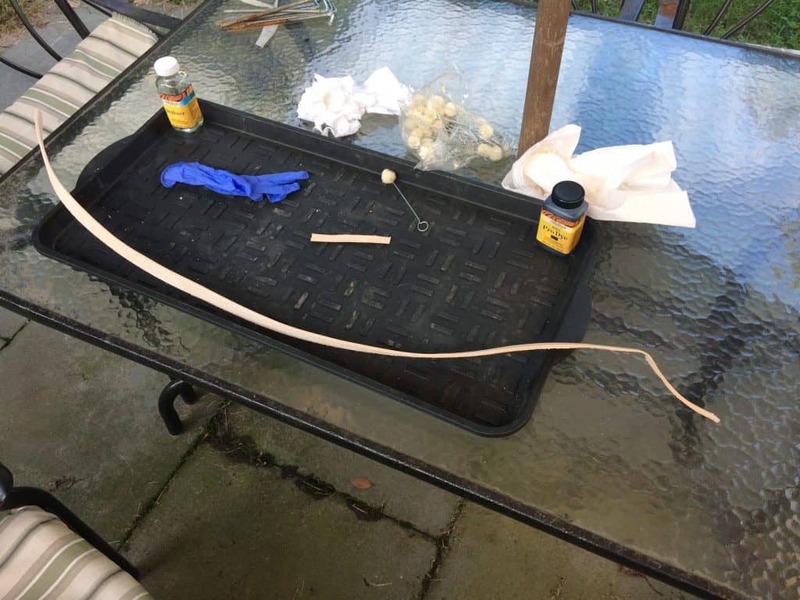 From watching online videos I held the edger at about a 45 degree angle to the leather corner, and pushed it forward slowly, letting the tool do the work. The blade was sharp and it cut nicely. The one I used was a CrazeEve edger – I had never heard of that brand before but it had great reviews on Amazon (https://www.amazon.com/gp/product/B01EMN2VZ2). I would have to agree with those review, based on the first use. So now I had a few leather edge scraps around the table, I was starting to feel like a craftsman haha! But there’s way more to do. so what next? I had purchased a groover and thought I would try it on the same end (also in case I messed up and had to cut it off). For the groover, I got a Kyoshin-Elle (https://www.rmleathersupply.com/products/kyoshin-elle-edger-groover), hoping for a bit more quality than pure entry level ones. I adjusted the width and slowly lowered the cutting element onto the leather; I was expecting it to scrape and be difficult to pull towards me. Surprisingly, it cut an even groove so smoothly into the leather edge. Pulling it towards me, it kept a straight line and a little thread of leather spooled up through the cutting hole, making almost a leather thread by the time I worked my way down the belt. I would have stopped earlier, though it was going so smoothly and it makes one connected cut, I didn’t wan’t to stop too many times. Once or twice I did just to check the work, and before I knew it, I had a glove the length of the belt. I did the same to the other side, and now the belt had some simple, yet classic decorative lines to it. Then I measured about where the buckle would go and the leather need to be folder over, and used a skiver to shave off some of the leather. This is definitely an acquired skill (I didn’t really have yet!) The skiver (https://www.amazon.com/Tandy-Leather-Super-Skiver-3025-00/dp/B0036KZ9KC) had a good sized blade, so I carefully pulled it towards me and removed layers of leather. Some cuts I pushed too deeply and had to skiff around it to even things out, but luckily, I didn’t cut the leather so thin it separated, so in the end all is good enough to proceed. And, since this will fold onto itself, it won’t be seen in the final product anyway. Next I was excited to try out the punch. I got a 4.5mm (https://www.rmleathersupply.com/products/copy-of-ks-blade-interchangeable-hole-punch), thinking it would serve purposes for most holes I would need, if I had to choose only one punch to get initially. I measured for the belt buckle hole (where the bar pushes through the belt, the one that goes into the holes), and used a simple CS Osbourne awl (https://www.amazon.com/gp/product/B01N2JTVMF) to mark the hole location. Since I didn’t have an oblong punch, I just marked a second hole about 1 inch away, punched both (with a really basic mallet (https://www.amazon.com/gp/product/B075GGB3N5), and used a cutting knife to make straight cuts between the holes to join them, and make an oblong opening. Done. After I was feeling pretty good about punching the buckle holes. I wasn’t too concerned with spacing initially , just wanted a bunch of holes for practice, and that would hopefully fit me later on, so measured about where I thought they should start, and punched several holes in, maybe about 1/2” apart. This might be too close, then again, I’m just experimenting at this point. The punch was really smooth and sharp, making the holes with really crisp, clean cuts with little effort. I wanted to give the belt tip some character, so had an english point strap punch, also a Kyoshin-Elle (https://www.rmleathersupply.com/products/kyoshin-elle-english-point-strap-punch-4-sizes), lined it up, and punched the end. It came out pretty clean. The punch was a little wider than the leather (I should have used a different size, though only had one so was going to make it work 🙂 ). I used the edger to go around all of the edges, and lightly burnished it with the wood hand burnisher. looking at it, not too bad. I then remembered I needed to make a belt loop! Luckily I had a little piece of scrap that I cut a small width from. 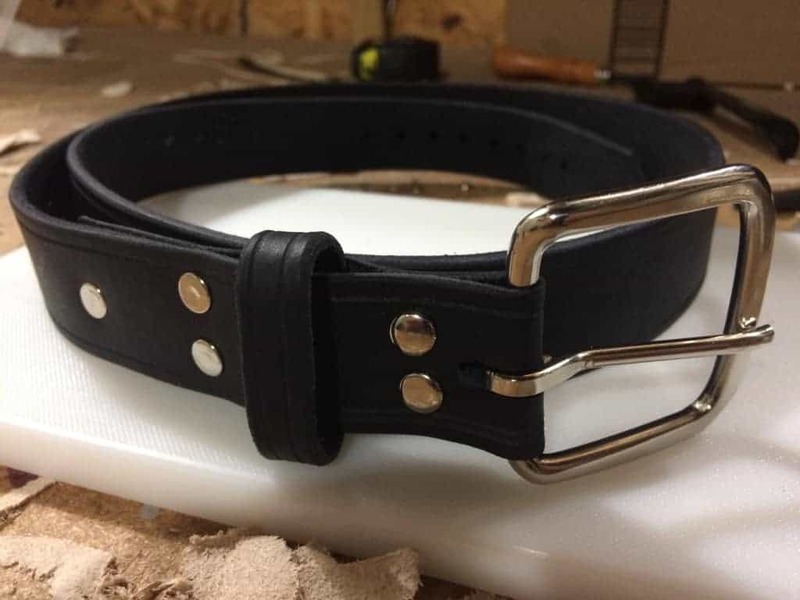 It was just long enough to work, whew 🙂 I grooved and edged it similar to the belt, so the styling matched. Next, it was time to dye it. I went out in the yard and laid a trash bag onto a plastic shoe tray (like the ones you put wet shoes in by the door after coming in from outside on a rainy or snowy day), and put that onto a table. It’s usually best to dye outside since the vapors of the deglazer aren’t great to breathe in. I crossed my fingers, hoped for the best, and applied the deglaze (https://www.rmleathersupply.com/collections/dyes-stains-finishes/products/fiebings-deglazer-dye-prep), with some daubers (https://www.amazon.com/gp/product/B072BN78NG) (I had only recently learned what those were haha, and let it dry. 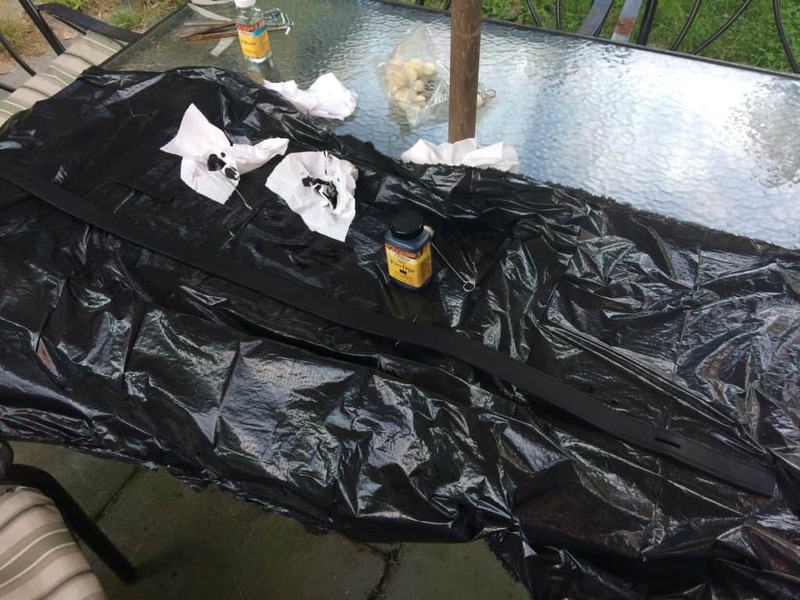 A little while later, maybe 20 minutes, I did the same to apply the dye (https://www.rmleathersupply.com/collections/dyes-stains-finishes/products/fiebings-professional-oil-dye-all-colors). I waited about 15 minutes more, probably should have waited longer, applied a second coat of dye, and let it site to fully dry. Oh! I almost forgot again, the belt loop 🙂 I quickly did the same to the loop, and let it sit to dry next to the below. About 2 hours later, I applied some wax sealer (https://www.rmleathersupply.com/collections/dyes-stains-finishes/products/fiebings-carnauba-creme-wax-leather-sealer), and it was ready for finishing! I probably should have left more time before sealing it, though again this was just to try everything out and see how the process went. Now we get to put on the hardware, so close to being a real belt! But I’ve never really riveted before, ample opportunity to mess it up, oh no haha. I fed the buckle through the oblong hole and test folded the leather over, it worked. The buckle I have is wider than the belt leather, though it was the only buckle I had on hand and would make it work. Next with the awl, I marked off two holes behind the buckle, stamped them and riveted them. For the rivets, they get pressed into each other loosely (they sort of stick together which makes it easier), then one rivet is placed into a concave metal holder to hold it in place while the second is positioned under a rod with a concave end (to hold the top rivet in place) and hit with a hammer. The hitting force sets them together, and the rivet is solid! The buckle is now firmly in place, and next I needed to add the loop. 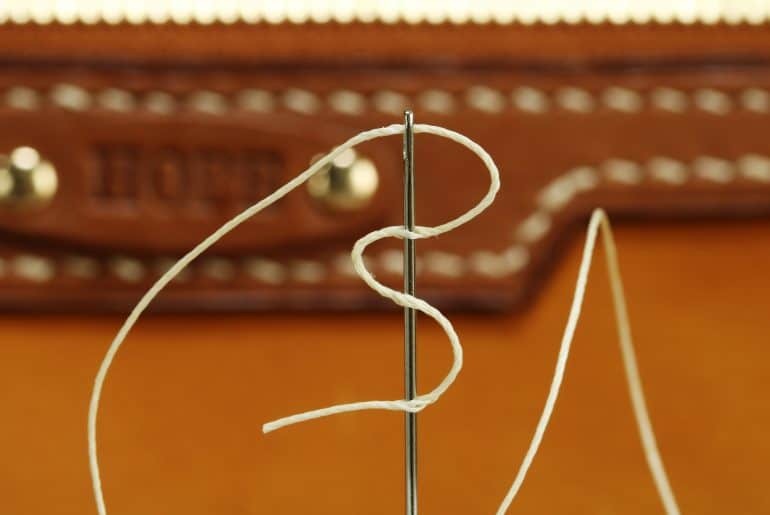 I joined the flat leather piece of material for the loop, into a loop by riveting it in the middle, then slid it over the belt. I marked two more rivet holes, stamped them, riveted them, and the loop was then secure too. There was a little bit of material left beyond the loop rivets, so I added one more rivet to secure that in place. I might design it differently next time (more for aesthetics), but for this, it worked great. I stood back, and looked. Before me was this thing, a belt, with rounded edges, a buckle, loop, and holes. Whattt? But would it work? I picked it up and slowly wrapped it around me, bringing the holes closer to the buckle, would it fit? Yes! I put so many holes so close together that one of them had to work 🙂 I fastened it and stood proud at the very basic, but very finished piece of craft I now had – it wasn’t pretty, and maybe a little rough, but it was there 🙂 And more than anything, it was fun. So that was the first project; certainly I learned a lot, and tried out several new things. I hope you liked checking it out. Do you have a project in mind or any tips to share? Let me know in the comments below.